This workshop will teach you the only patellofemoral program demonstrating evidence based practice after an exhaustive double blind placebo controlled clinical trial. In the workshop you will learn assessment skills and treatment strategies to address patellofemoral pain, patellar tendinosis, fat pad irritation, illiotibial friction syndrome, recurrent subluxation, pes anserinus bursitis, chondromalacia and osteoarthritis of the tibiofemoral and patellofemoral joints. assess the static and dynamic alignment of the lower limb in relation to how it affects the knee as well as assessing the alignment of the patella. evaluate quadriceps and gluteal control. evaluate the integrity of the lateral structures. tape to correct patellar alignment and decrease symptoms of fat pad irritation and patellar tendinosis, as well as osteoarthritis, illiotibial friction syndrome and subluxation. design a home exercise program. use surface EMG for neuro-muscular re-education. This course will examine osteoarthritis, the signs and symptoms of the osteoarthritic knee and the degenerate meniscus, as well as discussing the long-term effects of anterior cruciate ligament reconstruction. It will look at intervention strategies that you can use and will demonstrate the effectiveness of these strategies from evidence in the literature. It will provide simple strategies for patient self-management to help improve function and quality of life for the older knee, minimise painful recurrences and avoid surgery where possible. This course includes theoretical and practical components, and explores recent studies in order to give a greater insight into treating the older knee. You will also gain pain management strategies for post-knee arthroplasties to assist rehabilitation. The lower extremity program is designed to provide you with a thorough understanding of biomechanical and manual therapy principles for the treatment of lower extremity overuse conditions. Course participants will explore the intricacies and interaction of the entire lower extremity through lecture and lab sessions. Learn to assess and manage common overuse pathology of the hip, distal lower leg and foot. correlate assessment findings to lower extremity pathology such as trochanteric bursitis, anterior hip impingement, hallux valgus, achilles tendonitis, shin splints and chronic muscle strains. modify the position of the hip and foot through taping. improve lower extremity motor control through mobilization, taping and dynamic training techniques. understand and apply specific motor control exercises for training of the lower extremity. Learn how the static and dynamic posture of the upper extremity may contribute to the patient’s signs and symptoms at the shoulder. This program includes a review of shoulder biomechanics and will examine the influence of thoracic spine stiffness, muscle tightness and muscle control problems on shoulder girdle movement. Numerous intervention strategies will be discussed. 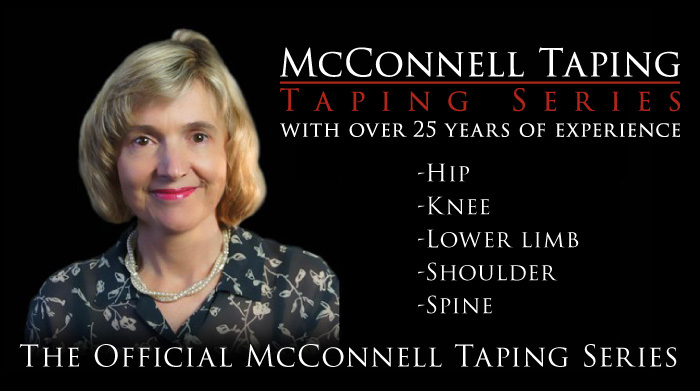 There is an extensive lab component teaching Jenny McConnell’s shoulder taping and muscle training techniques. Learn treatment strategies to address impingement, frozen shoulder, anterior translation of the humeral head, and multi-directional instability. discuss ideal shoulder posture and muscle function. evaluate glenohumeral position and thoracic spine stiffness. mobilize a stiff thoracic spine. tape to attain more appropriate alignment of the shoulder and unload painful structures. This eight day workshop will examine how an individual’s structure determines how they move and the impact their structure has on the way load is distributed as well as the consequences the loading has on symptom production. The importance of starting position, creep and adaptive shortening will be highlighted, and the way these issues impact soft tissue structures and pain development will be discussed. A theoretical and evidence-based underpinning to the material will be provided. Assessment and treatment of lumbar spine, hip, knee, foot, shoulder, cervical spine and jaw will be analysed. Strategies for rescuing the older knee and shoulder, as well as chronic back, headache and whiplash problems will be addressed. Learn how the static and dynamic posture of the upper extremity, cervical spine and jaw may contribute to the patient’s signs and symptoms. This program includes a review of shoulder biomechanics, jaw mechanics and different aetiology of headache. It will examine the influence of thoracic spine stiffness, jaw symmetry, cervical spine movement, muscle tightness and muscle control problems on shoulder girdle and neck movements. Numerous intervention strategies will be discussed. There is an extensive lab component teaching shoulder and upper extremity taping muscle training techniques. Learn treatment strategies to address impingement, frozen shoulder, anterior translation of the humeral head, and multi-directional instability, as well as headache, and cervical nerve root pain.